This landmark documentary, co-directed by Chris Marker and Pierre Lhomme, was filmed in May of 1962, just after the passage of the Évian Accords, which officially ended the Algerian War. During this “first springtime of peace”—the first time in 23 years that France was not involved in any war—the filmmakers interviewed a random assortment of people on the streets of Paris, an endeavor that was made possible by new technological advances, such as portable 16mm sync cameras. (An important predecessor for Marker and Lhomme’s project was Jean Rouch and Edgar Morin’s Chronicle of a Summer, a Paris portrait released in 1961.) Marker, unseen, prompts his interviewees—ranging from highbrow engineers to a destitute mother to an Algerian teenager to a West African student—with questions about their personal lives and their feelings about larger political and social matters. Giving shape to these candid responses is Simone Signoret’s piquant, poetic narration (co-written by Marker), which balances astringent assessments about Parisians’ disengagement with the world with an unequivocal empathy for many of the film’s interlocutors. Chris Marker is an artist. He has something to say about the ‘other France,’ the France we don’t see on the Champs-Elysees, and he says it simply and movingly. The title of Elie Wajeman’s striking first film refers to the immigration of Jews to Israel; it is there that hashish dealer Alex Raphaelson, currently living in a gritty section of Paris, hopes to start over by helping a cousin open up a restaurant in Tel Aviv. But many obstacles face Alex as he prepares for this voyage—primarily his burdensome older brother, Isaac (Cédric Kahn, a talented writer-director making a rare appearance in front of the camera), who constantly leans on his sibling for money. In between Hebrew lessons, Alex, drained of his funds by his needy, manipulative brother, begins selling harder drugs—which places him at the mercy of extremely dangerous men— to pay for his trip to Israel. Complicating his departure further, Alex falls in love with Jeanne, a fiercely intelligent, independent graduate student. Wajeman’s debut powerfully lays bare the onerous pull of family ties and intelligently questions whether, in relocating thousands of miles away and starting anew, we can ever really escape ourselves. Aliyah quickly turns away from American mythology in order to build an uneasy and sensitive portrait of a young man whose departure to Israel (“a lame country like me” he says) seems less of a solution to his problems and more like stepping out of the fire into the frying-pan, which is politically quite incorrect. Full of the same astute and compassionate observations about unraveling, unhappy relationships, conjugal and otherwise, that distinguished his previous work, A Separation (2011), Iranian director Asghar Farhadi’s latest film is set in a working-class suburb of Paris. It is there that Marie (Bérénice Bejo) lives in a cramped house with three children, her two daughters and the young son of her boyfriend, Samir (Tahar Rahim), whom she hopes to marry soon. But before the couple can even begin to consider wedding plans, Marie must finalize her divorce from her estranged husband, Ahmad (Ali Mousaffa), who flies into Paris from Tehran for the court procedure. While staying with his soon-to-be ex-wife, Ahmad immediately becomes aware of the resentment, rage, and hurt harbored by many of those living under Marie’s roof: Her older daughter, the teenage Lucie (Pauline Burlet), for example, seems to be excessively hostile to Samir. As Ahmad tries to make sense of all this misery, including his own with Marie, Farhadi masterfully mines the regrets that have bedeviled The Past’s adult characters—whose despair permanently marks the younger ones. Farhadi proves again that he can craft a domestic drama that has all the tension of a thriller. Working on a scale both intimate (a father’s wounded ego) and epic (a nation torn apart by civil war), writer-director Mahamat-Saleh Haroun creates a remarkable portrait of present-day Chad. Adam, a 55-year-old former swimming champion, takes great pride in his work as the pool attendant at a luxury hotel in N’Djamena, the nation’s capital. Adam is assisted in his job by his son, Abdel; their friendly competitiveness is highlighted in the film’s opening scene, as the two men see who can stay underwater the longest. At home with his wife, with whom he is still blissfully in love, Adam pays little attention to the news reports of insurgent attacks on the Chadian army. But the father’s life is upended when his boss tells him that his son will be replacing him as the sole pool attendant. Reeling from this blow to his self-worth, Adam makes a treacherous decision, agreeing to the local district chief’s demand that he offer Abdel instead of cash as his mandatory contribution to the war effort. Adam gets his cherished job back, but the joy it provides is no match for the guilt and torment he now must endure. Haroun’s tender but unsentimental regard for his characters allows his storytelling a natural gravitas thoroughly suited to the simultaneously unfolding private and national tragedies. The feature-length directorial debut of actor Mathieu Demy—the son of eminent filmmakers Jacques Demy and Agnès Varda—is both a touching homage to the oeuvre of his parents and a project that evinces his own promising vision. Demy plays Martin, a Parisian real estate agent in his late 30s. After he receives news of his mother’s death, he flies to Los Angeles, her home for the past several decades, to settle her affairs. As Martin heads to the States, he is flooded with memories about his childhood years living with Emilie in her Venice Beach bungalow—flashbacks that are culled directly from his own mother’s Documenteur (1981), a semiautobiographical film starring an eight-year-old Demy. Martin next sets out for Tijuana, where he is in search of a woman named Lola, to whom Emilie bequeathed her home. “Lola” is a name of great significance: it is the title of Jacques’s first film, from 1961, starring Anouk Aimée as a cabaret performer in Nantes; Lola/Aimée would reappear in the LA-set Model Shop (1968), Demy père’s only film made in the US. One of cinema’s most melancholic dreamers, the elder Demy (who died in 1990) transformed the simplest of emotions into epics. Mathieu follows suit in this impressive first film. Americano is thus something of a sequel, in which certain moods and implications of his mother’s film — the loneliness that can seem almost like a geographical fact of American life, the distance that can invade even the most intimate relationships — are revisited and revised. Though not explicitly autobiographical, this film is deeply personal, and while the nature of cinema is very much on its mind, it rarely feels insular or self-conscious. Instead, it is wistful and nostalgic, and at the same time full of restless curiosity. Directed by Bertrand Tavernier, this razor-sharp satire of politics—both those enacted on the world stage and within the corridors of workplaces—originated in first-hand experience: The film is adapted from graphic novels written by Antonin Baudry, who worked as a speechwriter for Dominique de Villepin, the French foreign minister during the lead-up to the 2003 war in Iraq. (Baudry co-wrote the screenplay with Tavernier and Christophe Blain, who illustrated the books.) As the Baudry surrogate, Raphaël Personnaz plays Arthur, recently hired by the imperiously named, high-ranking diplomat Alexandre Taillard de Worms (Thierry Lhermitte), a man who speaks in orotund outbursts. These thickets of words, which grow more hilarious and nonsensical as the film progresses, combine egregious clichés, lofty quotations from the sages of ancient Greece, and impenetrable bureaucrat-speak. As Arthur scrambles to figure out just what, exactly, his highly capricious boss wants from him, the crisis in “Lousdemistan” (clearly a stand-in for Iraq) deepens. The new hire must also contend with the petty office squabbling of his territorial colleagues and their bids for power; meanwhile, the overweening Alexandre quite literally creates chaos wherever he goes. With its broad performances, rapid-fire pacing, and rampant visual and verbal gags, Bernard Tavernier’s first out-and-out comedy doesn’t try too hard to hide its graphic-novel origins. 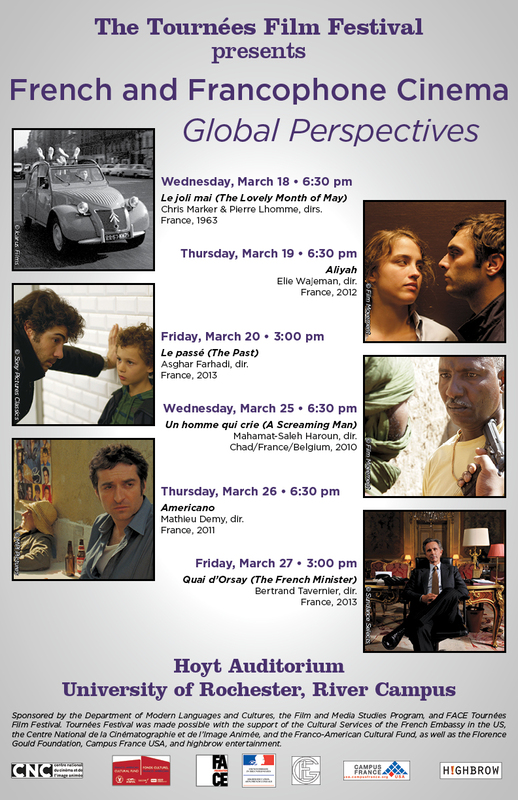 Sponsored by the Department of Modern Languages and Cultures, the Film and Media Studies Program, and FACE Tournées Film Festival. Tournées Festival was made possible with the support of the Cultural Services of the French Embassy in the US, the Centre National de la Cinématographie et de l’Image Animée, and the Franco-American Cultural Fund, as well as the Florence Gould Foundation, Campus France USA, and highbrow entertainment.